Once you have enabled acts in your storyboard project, it indicates that your storyboard is composed of a single long act. You must break it in several smaller acts. Before splitting a project into acts, you must to define the starting panel for each act in your story. In the Thumbnails view, click the panel where you want to create a new act. ‣ Select Storyboard > New > Start New Act. ‣ Right-click the selected panel and select Start New Act. 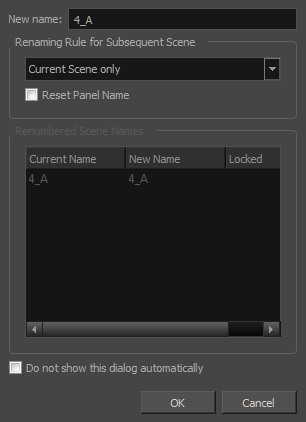 The Rename Scene dialog box is displayed. Enter a name for the new act and click OK. The act is divided in two at the point you selected.